3-2 UW with 9:11 left. 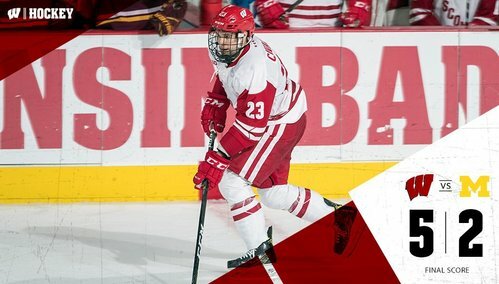 9:36 3rd | Wisconsin regains the lead (3-2) on Frederic's second of the night. Diving effort by Ustaski to try to get on side, but he couldn't quite get back. 3-2 UW, 5:45 left. 5:45 left in the third and the Badgers lead 3-2. They have the shots advantage 29-24. Tonight's announced attendance at the Kohl Center: 9,274. 4:50 left in the third, UW leads Michigan 3-2. Badgers have the edge in shots on goal, 29-26. Zirbel gets an insurance goal for UW. 4-2 Badgers. BADGERS GOAL: Jarod Zirbel finishes off a great pass from Cavallini, and it's 4-2 UW with 2:17 left. BADGERS GOAL: Grant Besse scores his first in 11 games to put UW ahead 5-2 with 1:59 left. Besse just tapped one in and the Kohl Center is going bonkers. 5-2 Badgers. Fat lady singing. Wisconsin with two quick goals to extend their lead to 5-2. Malone gets credit for the goal, as it hit a Michigan player in front, not Besse. Correction on the 5th UW goal: It goes to Seamus Malone, not Grant Besse. So Besse's scoreless string continues. Just over a minute left now. Oh and Cavallini is now in the box for roughing after a scrap with Cutler Martin. Martin is also in the box. 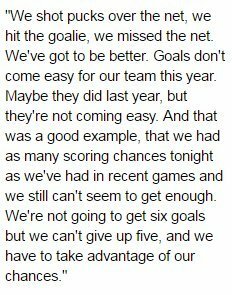 The #Badgers haven't had an easy time closing out victories lately, but two late goals make this a bigger margin. UW's Ustaski is called for playing with a broken stick -- second such call tonight -- with 37.6 left. Final: UW 5, Michigan 2. 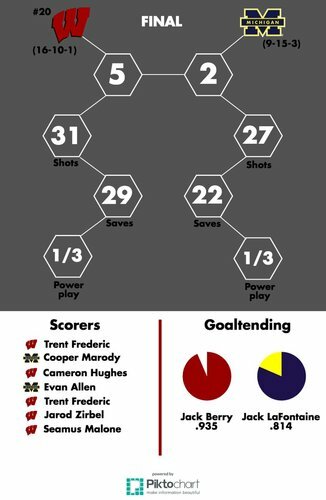 #Badgers earn three points, keep pace with Minnesota in conference title race. FINAL: Wisconsin beats Michigan 5-2, scoring three times in the last 9:37. Badgers stay 3 points behind Minnesota and in 2nd place. FINAL: Michigan falls to Wisconsin, 5-2. The two will be back at it tomorrow night to conclude the weekend series at 7pm CT.
Tony Granato: "After they tied it in the third was when we saw our team step up." Red Berenson on UW's Ustaski-Frederic-Kunin line: "That's a tough line. They're as good as anybody, and they showed it again." UW goalie Jack Berry, a Holly, Mich., native: "Being from Michigan, a lot of friends on that team, it's always good to beat up on them." On the waved-off Grant Besse goal, Granato said he wanted to use his challenge but ref told him he had a great view and blew whistle. On Trent Frederic, Granato said: "He was solid. He's been very consistent for a young player." Granato: "A win is a win in the Big Ten. These games are tough. It's a grind out there." Here's tonight's video recap/highlights from the #Badgers 5-2 win over Michigan.